Paper Money Guaranty® (PMG) certified over 250 selections from part one of the Ibrahim Salem Collection of British Commonwealth Banknotes. The amazing group includes numerous rare and important issues from current and former territories of the United Kingdom. PMG certified the notes at its first London on-site grading event, which was held in January 2019 at the office of NGC International UK Limited (NGC UK), the London-based affiliate of PMG. NGC UK will host the next PMG London on-site grading event in April. 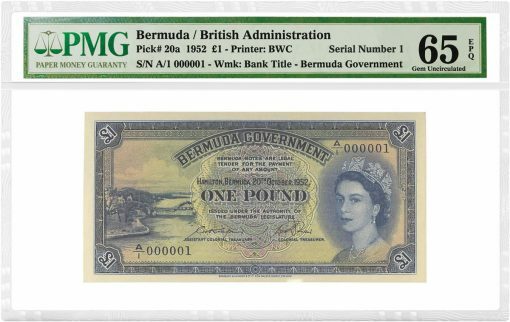 The PMG-certified selections from the Ibrahim Salem Collection of British Commonwealth Banknotes, Part I, number 253 pieces including 81 from Bermuda, 32 from the Bahamas, 31 from Gibraltar and 29 from Fiji. The notes, which range from the late 1800s to the 21st Century, have the Ibrahim Salem Collection pedigree on the PMG label. The notes were submitted by Spink, a global auction house founded in London in 1666. Spink will offer the notes for sale on April 17 with part two being sold later this year. "PMG’s global reputation for expertise and integrity made it the obvious choice to certify notes from a collection that covers nearly 150 years and six continents," said Spink’s Director of Banknotes, Barnaby Faull. "PMG’s on-site grading event in London provided an exceptionally fast turnaround time, helping us to bring this collection to auction sooner." Mr. Salem is a true titan of the notaphilic world, having built a collection of 150,000 notes over more than 40 years. In recent times, Mr. Salem decided to focus his collection on Arab and Middle East notes and has been selling off other portions of his collection. 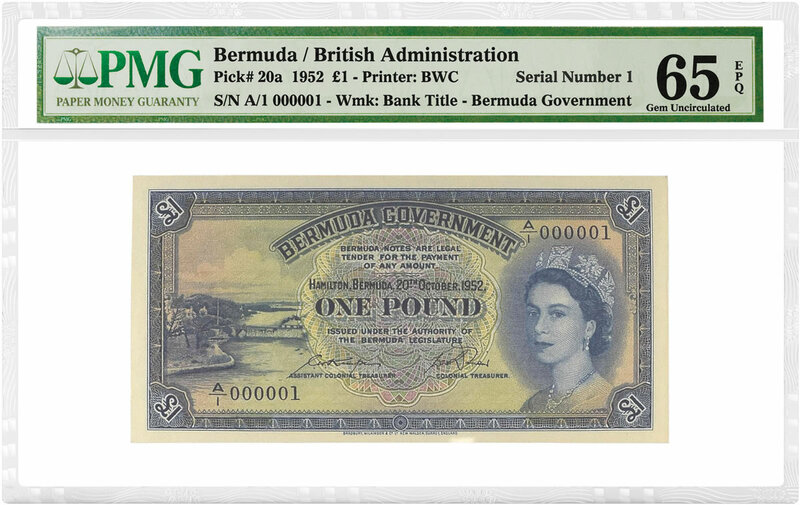 Among the highlights in the notes recently certified by PMG is a Bermuda 1952 One Pound note, with a portrait of Queen Elizabeth II at right, issued in the year she ascended to the throne. The note, a Serial Number 1, is graded PMG 65 Gem Uncirculated EPQ. 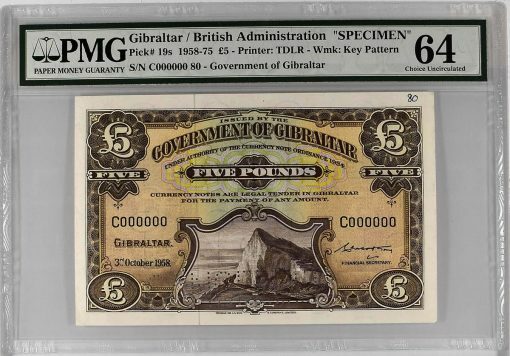 Another rare note is a Gibraltar 1958-75 Five Pound Specimen, graded PMG Choice Uncirculated 64. 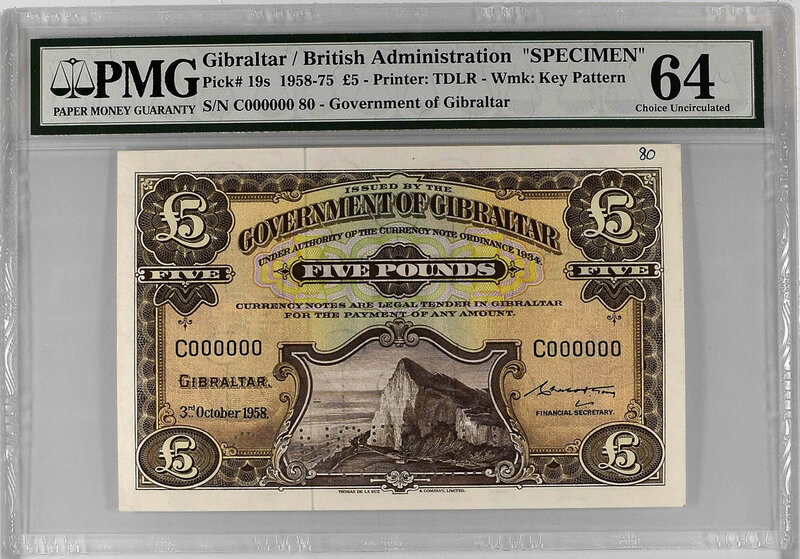 The note shows the famous Rock of Gibraltar, part of the strategically important British Overseas Territory at the western edge of the Mediterranean Sea. All of the PMG-certified notes in the Ibrahim Salem Collection of British Commonwealth Banknotes, Part I, can be viewed in an online image gallery at PMGnotes.com/salem or PMGnotes.uk/salem. "We are honored that Spink chose PMG to grade these outstanding notes, and we are pleased that our on-site grading event made the submission much more convenient," said Steven R. Eichenbaum, CEO of PMG. "Bidders can rest easy knowing these notes were certified by our expert grading team, whose determinations are backed by our comprehensive guarantee of authenticity and grade." For more information about Spink and to bid in this and other upcoming auctions, visit spink.com. Founded in 2005, PMG is the world’s most comprehensive third-party paper money grading and encapsulation service. To learn more about the company and its services, visit PMG.